On August 1st, 2014, we announced our 2014 180 Medical College Scholarship Recipients. We continue to shine the spotlight on our nine individual winners on our blog. So far, you have learned about Nichole and Danielle. 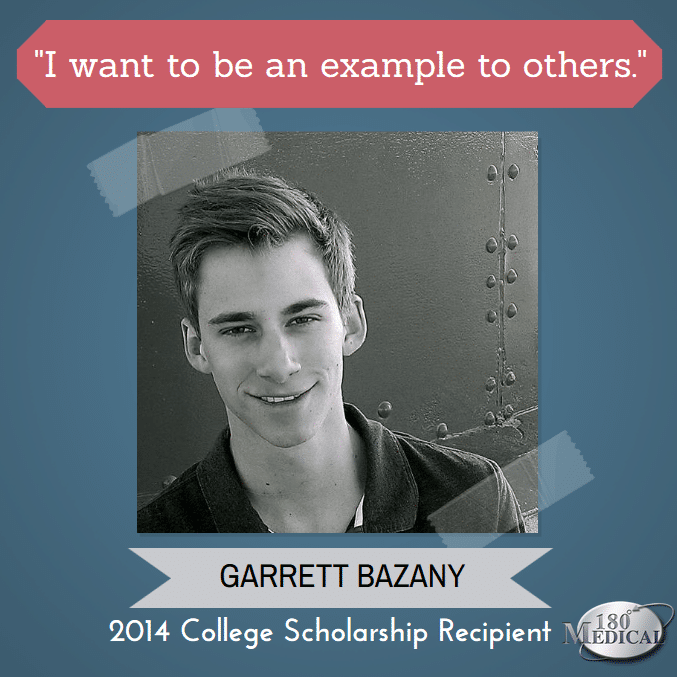 Take a moment to meet another well-deserving winner, Garrett Bazany. Being an incomplete quadriplegic meant he might not ever be able to walk again. The odds may have been against him, but through hours of physical therapy and sheer determination, Garrett was able to walk with the aid of a walker across the stage at his high school graduation. His classmates weren’t the only ones who were amazed — his story even appeared on the local news and the Today Show. While he is not walking on his own just yet, he has a goal to keep breaking the limits. Throughout high school, Garrett has maintained a high GPA (graduated high school with a 3.98 GPA) as a Distinguished Academic Leader and a member of the National Honor Society. He was voted by his Senior Class of high school as “Most Likely to Make an Impact.” In his first year at Calvin College, he was awarded the American College Foundation Visionary Scholarship Grand Prize and the Dean’s Scholarship for outstanding academic achievement. During this time, he has stayed active in his community, volunteering at the Special Olympics and at Mary Free Bed Rehabilitation Center, where he counseled and mentored other teen boys who were going through rehabilitation after a spinal cord injury. 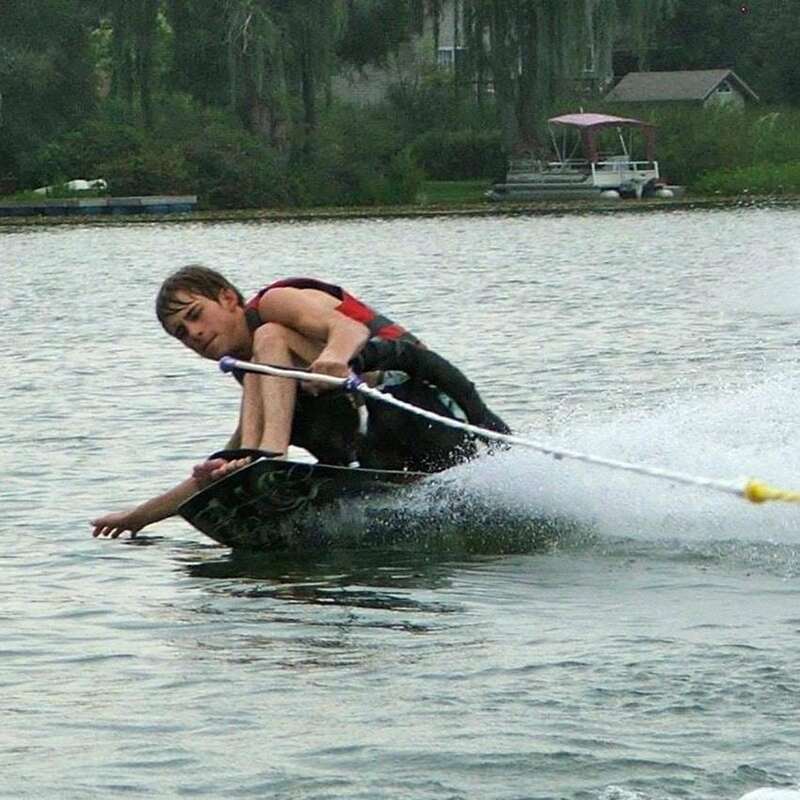 He also maintains an active lifestyle, participating in adaptive downhill snow skiing, adaptive water skiing, Intramural Dodge Ball, indoor rock wall climbing, and kayaking. Garrett is now in his second year of attendance at Calvin College. He is majoring in Pre-Medicine, and his goal is to become a rehabilitation physician to help others faced with similar experiences to his own. “I will be in a unique position to really make an impact in the world of rehab and advocate for others with a disability since I have firsthand experience on what it is like to live with paralysis,” he says. We here at 180 Medical are excited to see what Garrett achieves and how he will touch others’ lives with his positive attitude, his experience, and his future career. 180 Medical is honored to have a scholarship program to help those with spinal cord injuries, spina bifida, transverse myelitis, and/or a neurogenic bladder. Paying for college isn’t easy these days, and we understand that there are often extra financial difficulties for aspiring students who live with these conditions. To learn more about 180 Medical’s College Scholarship program, visit https://www.180medical.com/Scholarships. Did you know that September is Spinal Cord Injury Awareness Month? Learn more here. The nine 180 Medical College Scholarship recipients have been announced. Come meet one of the recipients and learn a little more about her story and what she plans to do in college. Meet one of our nine amazing scholarship winners, Kayla, and learn more about her story and the goals she plans to achieve in college.